The Fashion and Diversity Series at The New School is a dynamic lineup of events featuring conversations on the intersections of fashion and culture. From race and fashion to women in the media, the series tackles the core of diversity in fashion and unveil, inspire and empower attendees to not just talk about diversity, but also challenge them to critically engage and work toward solutions. 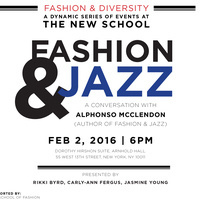 Join Alphonso McClendon, author of Fashion and Jazz, as he discusses the fascinating history of fashion’s dialogue with African American art and style, from Billie Holiday to Louis Armstrong to many in between and beyond. The event is part of the “Black History Month at Parsons” series supported by the School of Fashion, The School of Art, History, Design and Theory, the Office of Development and the University Student Senate.